Missionaries Jon and Carol Shaneyfelt were introduced to the need for people with computer/technical skills to be involved in Bible translation by a friend who was already a missionary pilot in Papua New Guinea. When they investigated further, they discovered that there are over 200 positions needing to be filled by people with computer/technical skills. Jon saw that his skills could be applied to technical support for Bible translation. 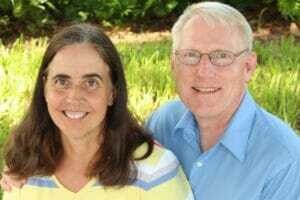 After a time of prayer and consideration, Jon and Carol decided together to apply, and were accepted as members of Wycliffe Bible Translators, and then Lutheran Bible Translators. As they prepared for their roles, God showed Jon and Carol that He wanted them to be involved in the task of Bible translation. When the leadership of the language software development team asked where he would most like to apply his skills, Jon responded, “I would like to work on what is most urgently needed”. They assigned him to work on the Translation Editor. After two years of developing and testing Translation Editor, it was released as a part of the Fieldworks package. Since then Jon has been working on research and develop of electrical power systems for Bible translators around the world, especially focusing on computer power system monitor that helps maximize efficiency and longevity for batteries used in solar charging systems. His work prevents many systems from premature battery failure. Currently, Carol’s priority is communicating with their current partners as well as and setting up appointments with individuals, churches, Bible class and other small groups to encourage new people to participate with them to support Bible translation. Please pray for Jon and Carol as they support Bible translation with their time and skills. Please also pray and ask God how you might be involved.